Dave Stephens woke me up at around 5:00 AM on 9 July 2005. 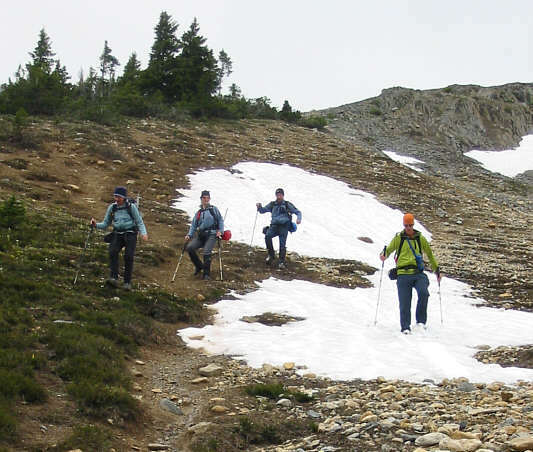 This was the day that six of us from the Rocky Mountain Books WebForum--Linda Breton, Vern Dewit, Dinah Kruze, Bob Spirko, Dave and me--were planning to do an ambitious four-peak traverse from Mount Kerr to Mount McArthur in Yoho National Park. It had rained all night, and I could still hear raindrops bouncing off the fly of my tent at the campground in Little Yoho Valley. 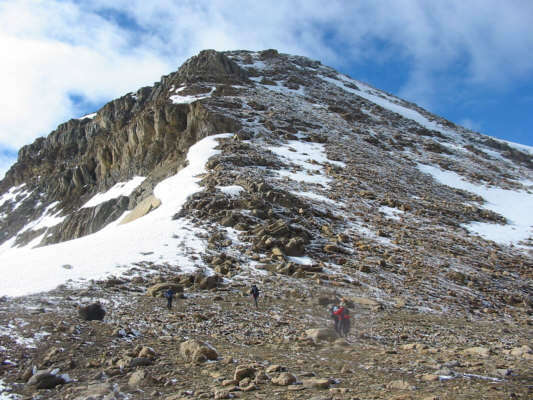 The weather didn't sound too promising, and deep down, I knew we would all be lucky just to bag Mount Kerr, let alone the other three peaks of the traverse--Kiwetinok Peak, Mount Pollinger and Mount McArthur. The Stanley Mitchell Hut was dead silent when Dave and I entered to eat breakfast. One by one, the rest of our group slowly joined us, and in the meantime, the skies started to clear up outside. Encouraged by the improving weather, we gathered our gear and began heading up to Kiwetinok Pass at around 7:45 AM. When we reached the pass, we could see that there was still a fair bit of snow--some of it fresh--on the surrounding peaks. 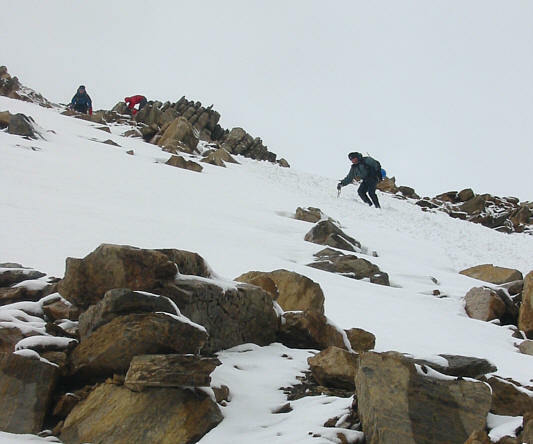 Getting up Kiwetinok Peak was no longer feasible, and even Mount Kerr looked uninviting. 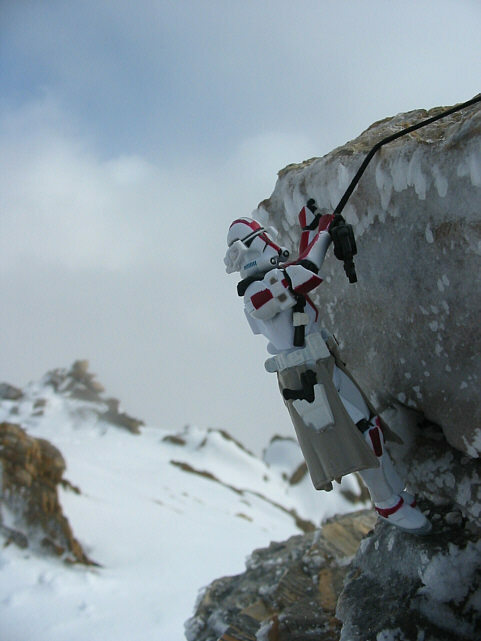 Although Vern had already bagged this peak on a previous trip, he was a really good sport and accompanied the rest of us up Mount Kerr's slippery north slope. 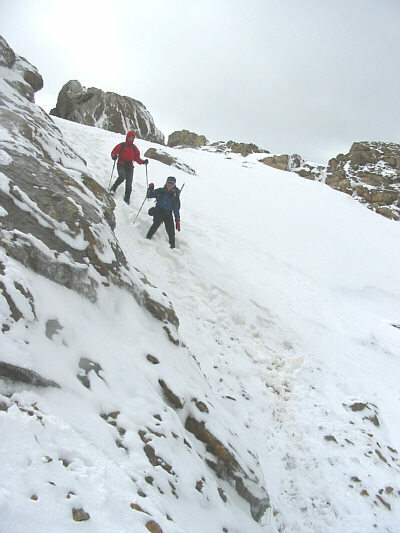 Near the summit, we all had to jump down a slippery two-metre rockband onto a hard-packed snow slope in order to continue. It's rather funny that only Dinah expressed concerns about getting back up this rockband for the return trip. Perhaps blinded by summit fever, the rest of us simply shrugged as if saying, "We'll cross that bridge when we get there!" 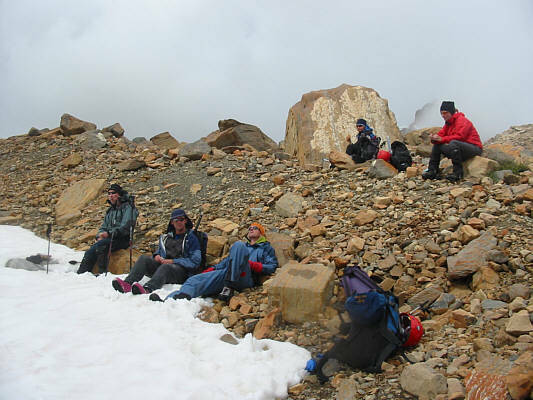 The weather on the summit of Mount Kerr was not pleasant, and none of us hung around there for very long. The aforementioned rockband was indeed difficult to get back up, but we all managed to muddle through and resume our descent down slippery rocks and snow to Kiwetinok Pass. Just for fun, Dave somersaulted off a cornice onto the snow slope just below the pass, and Vern and I followed suit. Unfortunately, I over-rotated and banged my knee against my ice axe prompting me to rethink the merits of "monkey see, monkey do". After a short break, we all headed back to the Stanley Mitchell Hut (round-trip time of about 5.5 hours). Dinah and I were done for the day (I retired to my tent for a five-hour nap), but the rest of the group had more adventures in the afternoon on some nearby moraines. Be sure to check out Linda's, Vern's, Bob's, and Dave's photos of this trip. 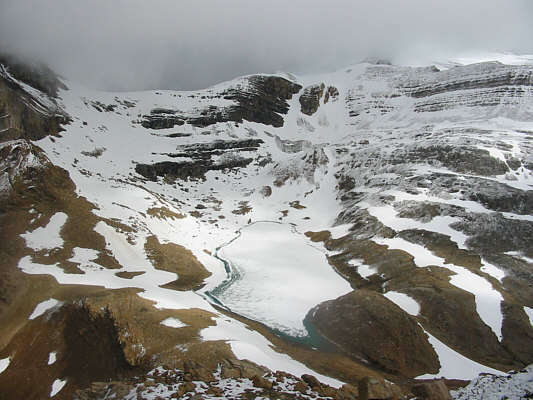 This is Mount Kerr as seen on the approach to Kiwetinok Pass (far right). 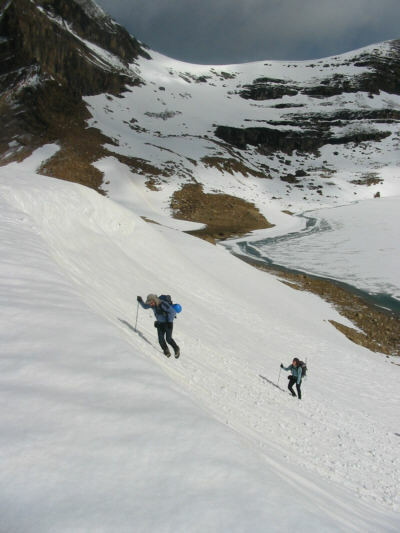 Bob and Dinah climb up the snow slope just before Kiwetinok Pass. Vern watches as Dave helps Linda climb over the cornice. Kiwetinok Peak is partially shrouded by mist and snow in the distance. 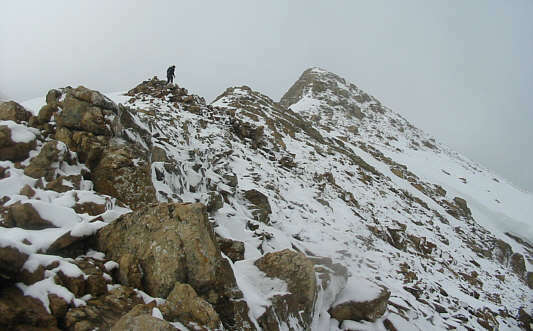 The group begins climbing the north slope of Mount Kerr. This is looking back down at Kiwetinok Lake from the upper slopes of Mount Kerr. Both Kiwetinok Peak (left) and Mount McArthur (right) are hidden in clouds. 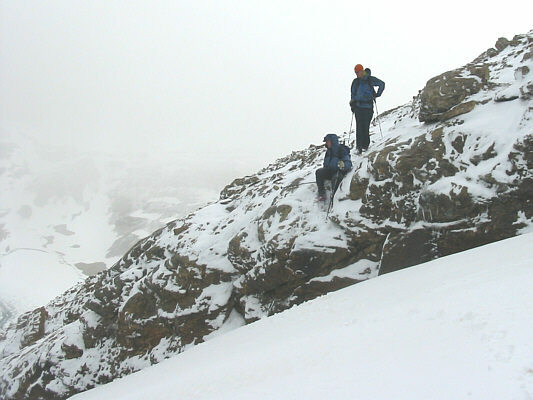 Dave approaches the summit of Mount Kerr. Vern waits for Dave to jump down the rockband. 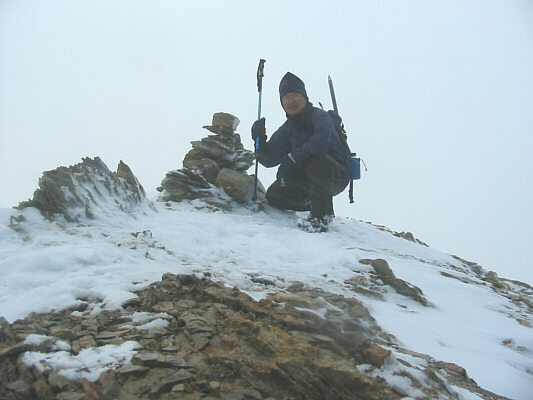 Sonny squats beside the cairn on the 2863-metre summit of Mount Kerr. Returning from the summit, Linda and Dinah look for a spot to climb back up the tricky rockband. Linda waits as Bob (bottom right) tries to help Dinah get up the slippery rockband. 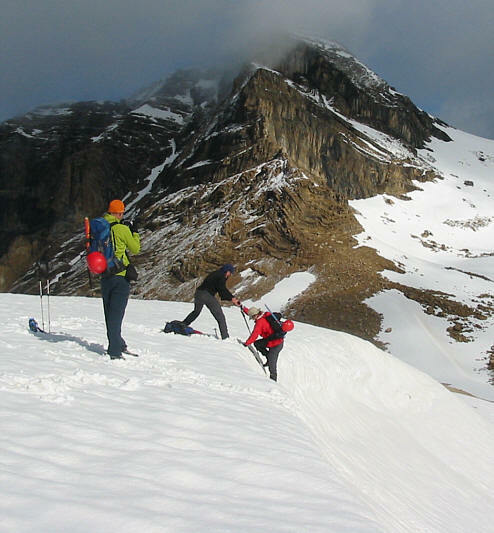 Bob (right) cautiously descends a snow slope while Dinah observes from above. Everyone takes a well-deserved break. L to R are Bob, Dave, Vern, Dinah and Linda. It's a race to the hut! 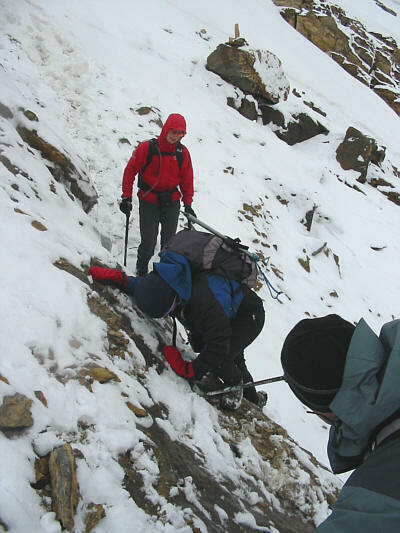 *Although the peak that we bagged on this day is the one described by Alan Kane in his guidebook, the elevation of this peak can be no higher than about 2800 metres according to my topographical map. 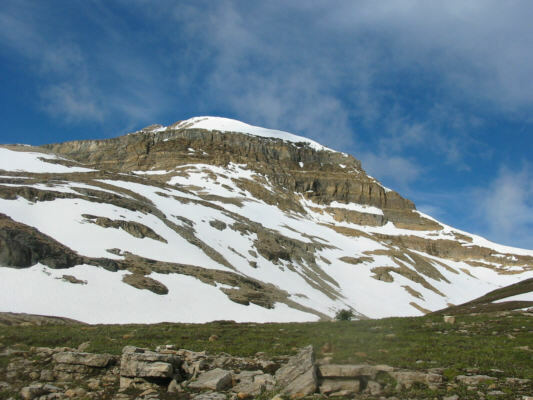 Mount Kerr's official height of 2863 metres would be more consistent with "the pointy peak lying immediately south". I would return the following year to bag this higher peak.